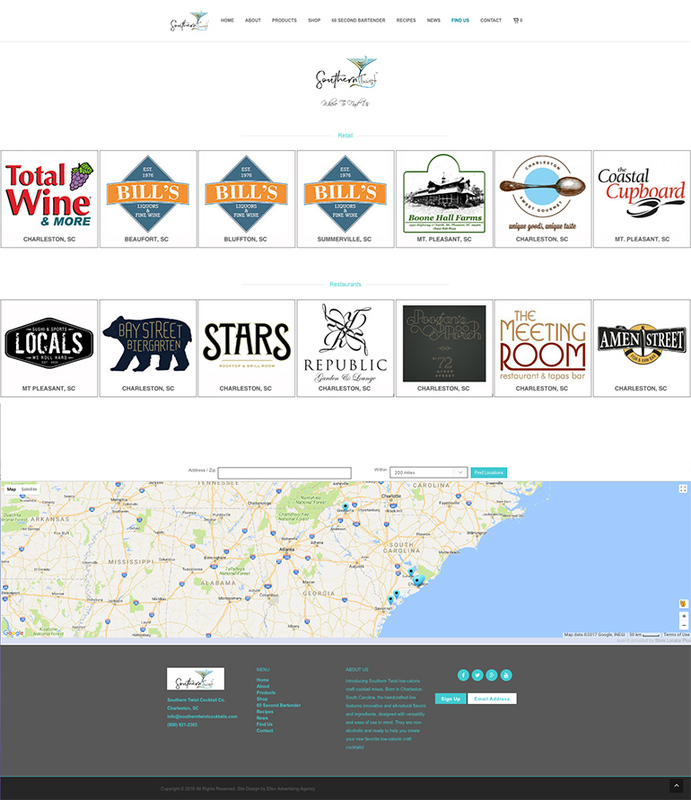 Southern Twist Cocktails - Ellev - The Best Full-Service, Award-Winning Ad Agency in the Carolinas! Southern Twist Cocktail Company – www.southerntwistcocktails.com – and their craft cocktail infusions have become a market staple in the bar and restaurant industry in the Southeast and throughout the rest of the United States. When it came time for the Charleston, South Carolina based company to build their new eCommerce website, they came to Ellev Advertising Agency. Rochelle Jones, creator and CEO, came to us to capture and create her vision for her craft cocktail line and continue it’s expansion through online sales and marketing. When designing their new website, Southern Twist wanted to have a very clean design with a site that was visually luxurious but yet still easy to navigate. So with these factors in mind, we started laying out the site as well as doing the new product photos to be used for the slider design and shopping cart. We began with a clean, white, minimalist design to show off the products and images. We also had to keep in mind the functionality of the website and maximizing the eCommerce experience in order to drive viewers to convert by shopping and purchasing. So with the market for Charleston, SC web design being very competitive, we were very pleased to be chosen over all the other ad agencies for the project! With the Southern Twist website we had a few specific goals to achieve in regards to the functionality of the interior pages. 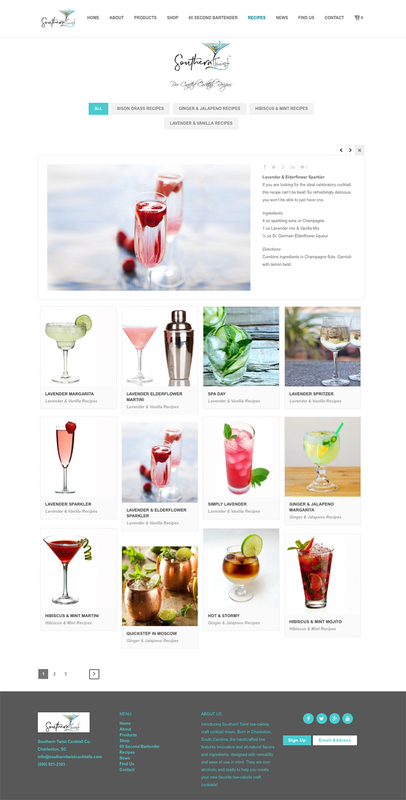 For example, the “Recipe” page needed to be a very clean and interactive design that was easy to navigate with great photography and imagery showcasing the cocktail infusions. The next challenge was the “Find Us” page. Southern Twist wanted it designed so that it would showcase the many locations that carry their cocktail infusions. So we accomplished this by designing a scrollable logo bar along with an interactive map. And lastly, Southern Twist wanted a video blog page to feature their “60 Second Bartender” which are short videos of Rochelle and other guests making specialty cocktails using the Southern Twist infusions! So we rolled up all these features, ideas, and designs to produce one heck of a website that blows the viewer away with a very unique experience that just as unique as Southern Twist Cocktail Infusions! Very cool stuff!